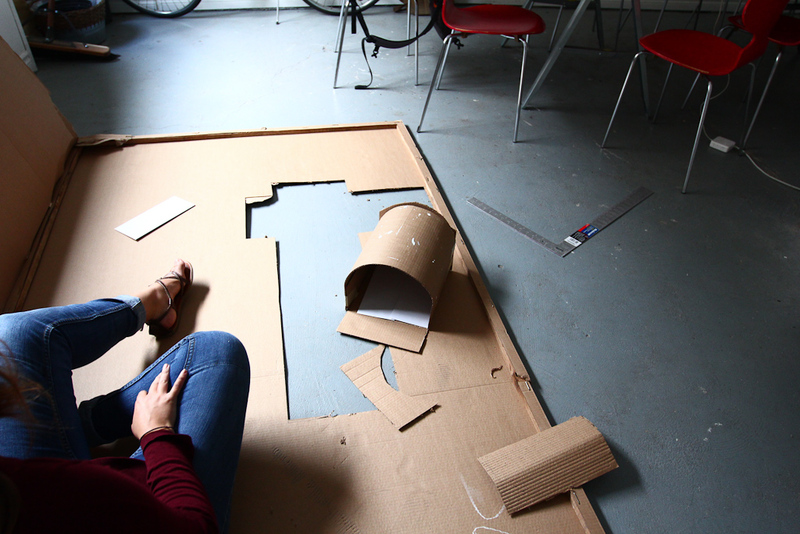 We’re in the preparation stages for an upcoming project called Civic Maintenance. The project will be based around the writing and distributing of a thousand letters (give or take) to residents of Windsor, thanking them for staying in the city, or contributing to it, or somehow having an impact on it, or maybe all of those things. The idea of maintenance (in a ‘civic’ sense, or city sense, maybe) is normally attributed to specific acts on infrastructure and the built environment, towards their preservation in a longer-term. It focuses on an cyclical act, a process that takes significant investment, and most often in a preventative capacity. We think that these kinds of acts could do well to be more closely connected to the people who make up this city, towards preserving a sense of belonging, and investment in this place, and in the largest and most symbolic sense, towards convincing people not to pack up and leave. 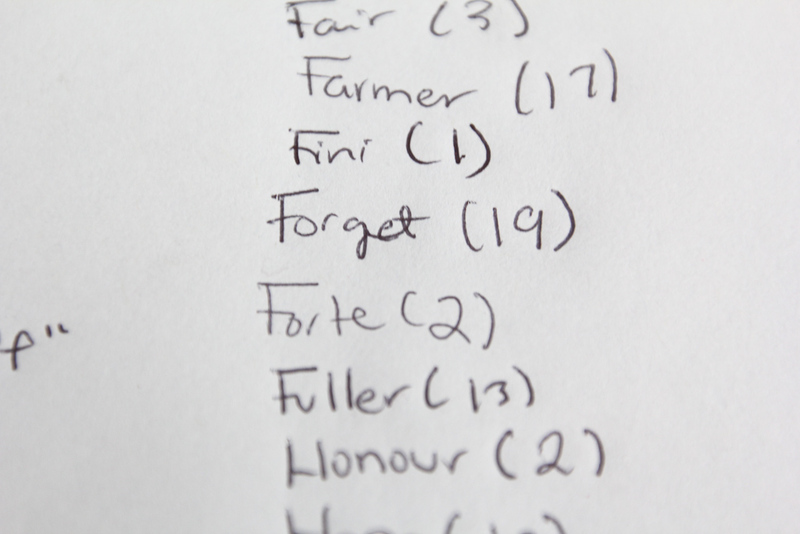 These early stages begin with an attempt to narrow down the list of people to receive our letters. Initially, we considered doing a random selection from the phone book, but we soon turned towards a more explicit selection. 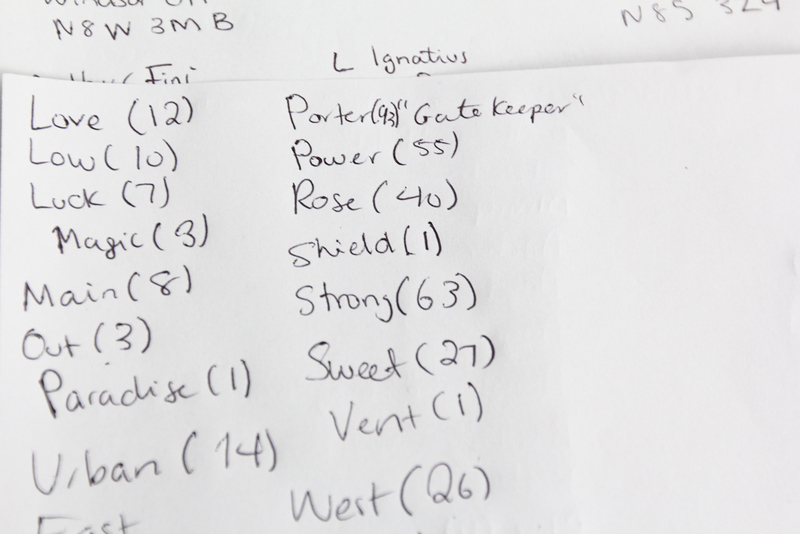 We still worked from the phone book, but instead started to pull last names that might act as a descriptor for the city, in one way or another. This is still developing, and we’ll be working to translate more last names as well..
Alongside the letter writing itself will be the exhibition design — a way of keeping track and organizing our process. 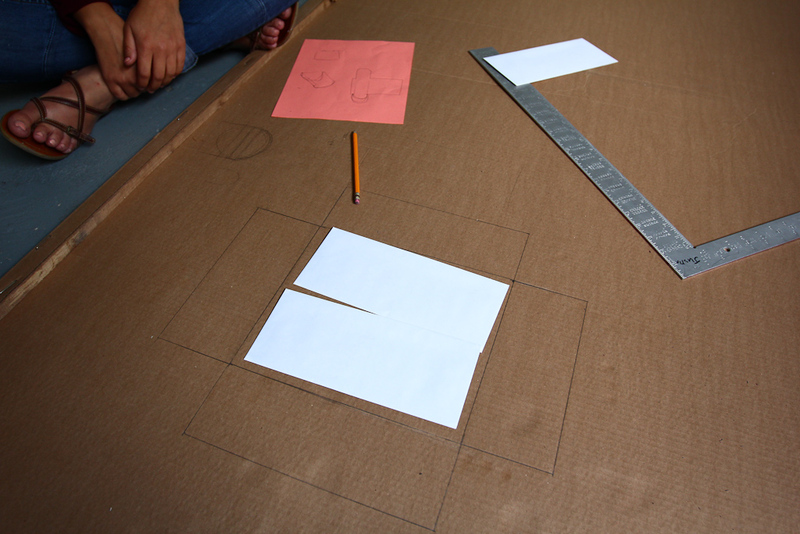 We began to piece together some very crude ‘mailboxes’ from cardstock and cardboard. 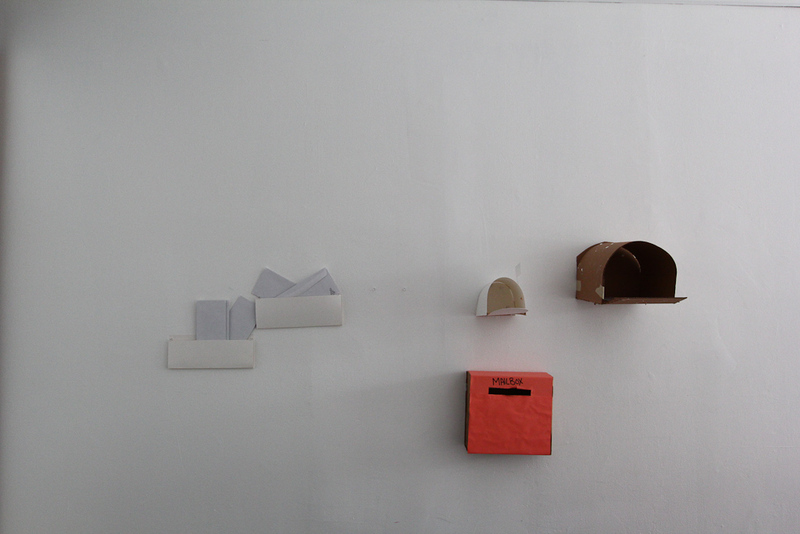 And boxes with coloured paper. 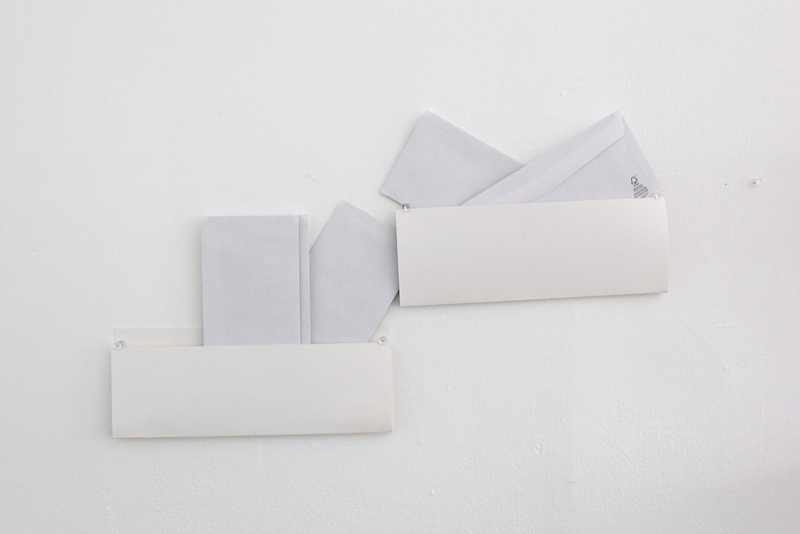 The mailboxes will be attached to the walls and provide a way to organize the letters — perhaps by last name, or sentiment, or geography, or quality of handwriting, or time, or something else. 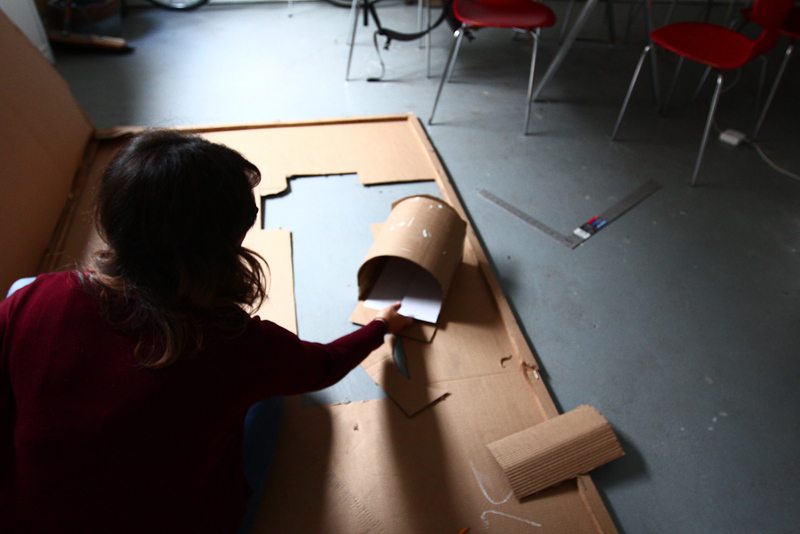 Intending to embark on an ambitious process to make cardboard mailboxes, we started to put together some templates. These mailboxes would be not unlike what we might see in a more rural setting. 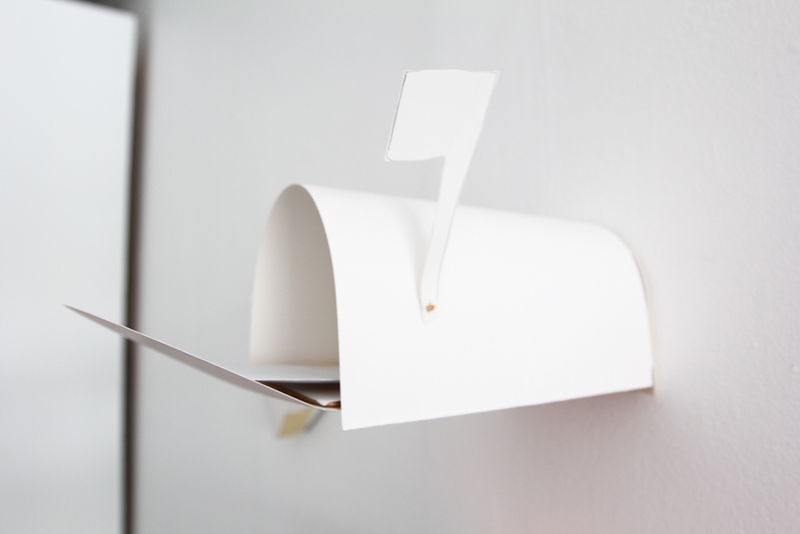 The form of these mailboxes seemed enticing, as a way to pull things away from being tacked on the walls. 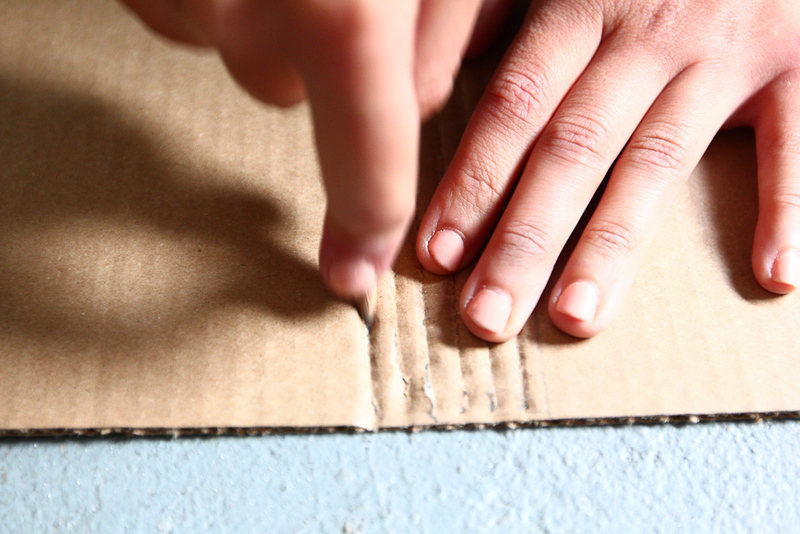 Hiba broke the corrugation to make the cardboard flexible to bend. 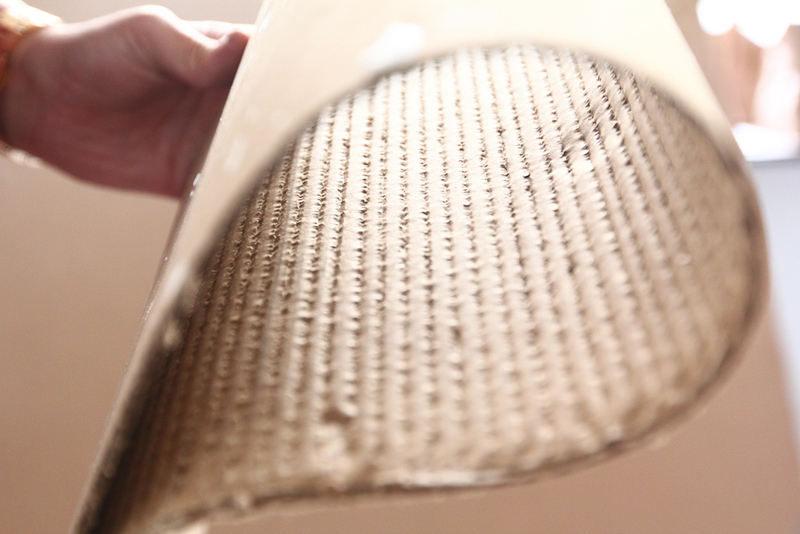 This gives the cardboard a lot more flexibility, but retains the outside finish. 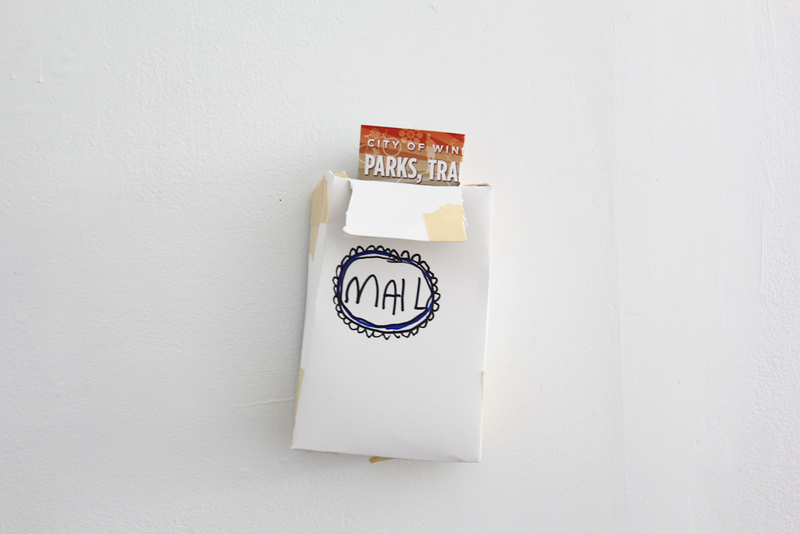 Rough mailbox design from cardboard. 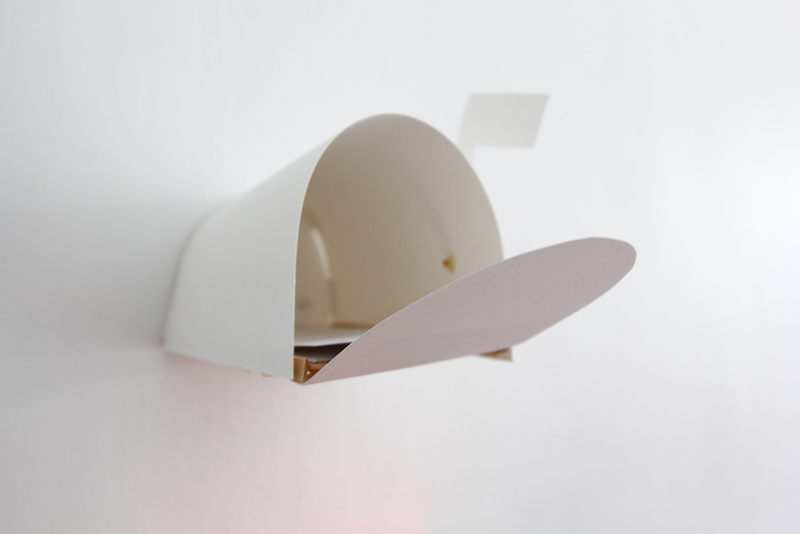 More of an exploratory design process than a movement towards any finished idea, this kind of mailbox might work at a smaler scale. And then, there were these. 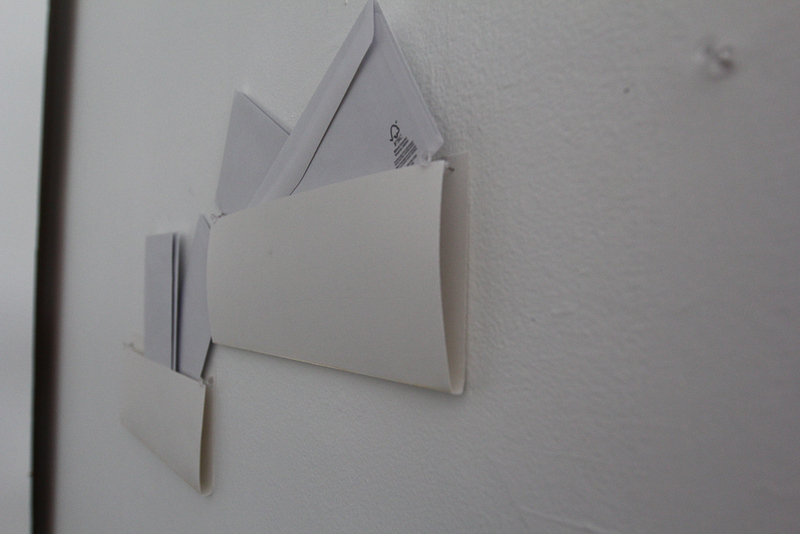 Simple folder-like design created from 9×12″ cardstock with the edges of pushpins holding it together. 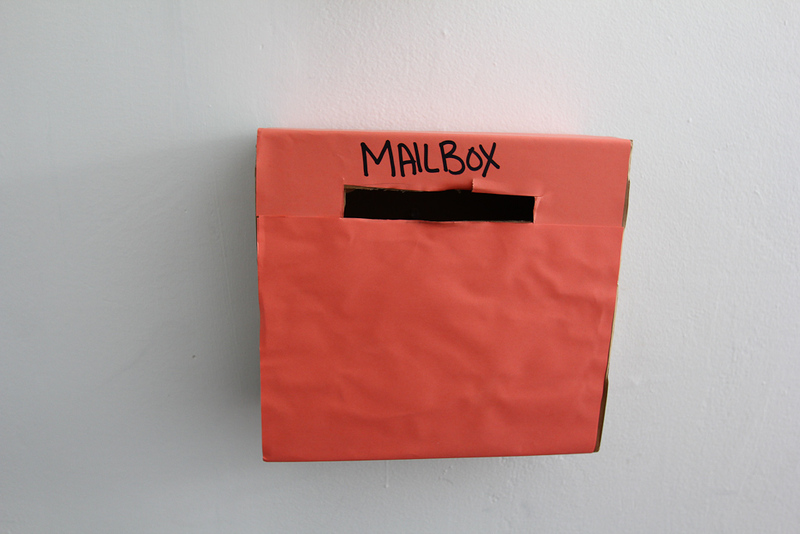 If we’re to make 30 or 40 or 50 of the mailboxes, these basic foldable designs might work best. 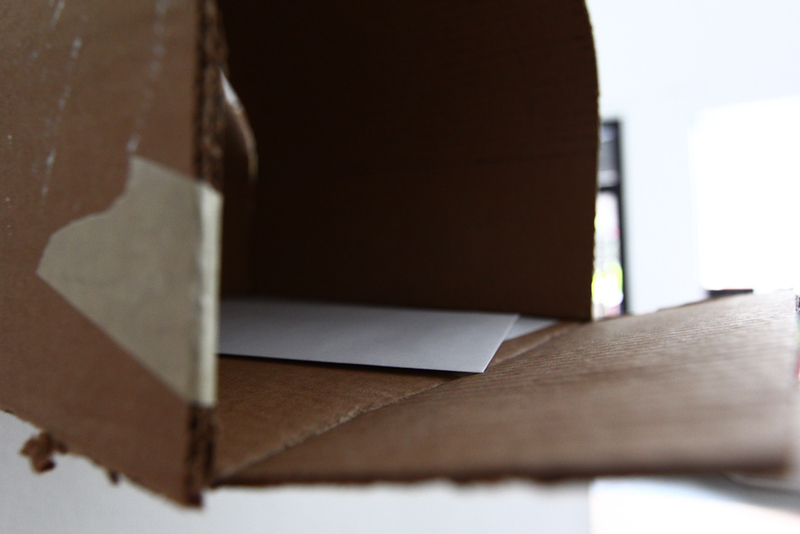 They also seem to make the envelopes more accessible in a way — rather than hiding them in the mailbox itself, the sizing of these folder-type mailboxes would make the envelopes more easily legible and would give us an opportunity to look an organization code more readily. That is, we need to figure out not only how to keep track of what letters are sent out, but what kind of data we create based on our last name selection system. We’re not sure where it goes yet, but it’s where we’re at by midweek. Amidst the biased newspaper articles and the rumoured reputations, Drouillard Road is actually in an okay place. A year or two ago, I was irked by a few things I had read in a familiar news source, depicting residents as downtrodden and troublesome, crimes and drug deals treated as the norm. But I knew better than to believe one reporter’s opinion and assume that Drouillard Road was a place with no hope. A Friday with everyone around the table usually translates into a lot of excellent new ideas, and yesterday was no exception! We spent the evening reviewing the progress we’ve made on some initial research and may have sparked an entirely new direction for the project. All of the excitement is after the jump! 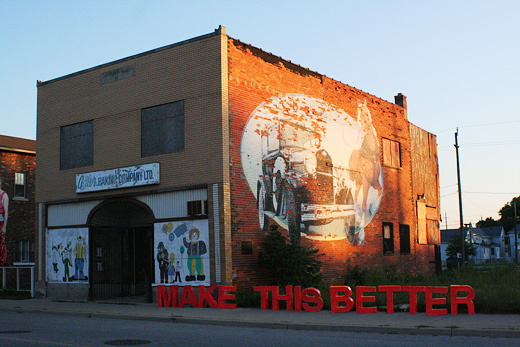 This is the first in what will be an ongoing series of posts as we temporarily install these letters across the city to generate some conversation and creative thinking around how we can indeed make this (place) better. You can check out the process of making these letters in this archive of posts. Ripper’s Valley is visible from the Riverfront bike path, which happens to be how I first became interested in it. As an avid cyclist, I very frequently ride down this section of the Riverfront path and quite often see a bustling community of families, a diverse range of cultures, a balanced number of mothers and fathers, grandparents, babysitters and children using the play equipment and nearby benches during the day. However, within feet of this area is a dead-zone. The entrance to the railway cut is dark, looming, and segregated from the Riverfront Park. In my experience, children venturing toward the entrance are most often called back by their parents and reprimanded to stay within the direct area of the play equipment. Prepping for Next Week- Last Coats and Beads! Yet another extremely productive weekend at BCL HQ! 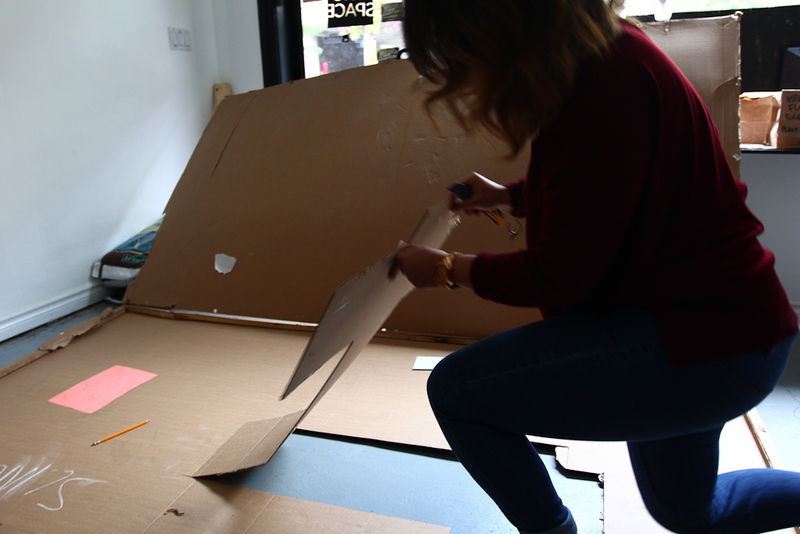 We’ve been finishing up the last preparations for our cardboard letters, which we hope to be unveiling them in our first chosen spot next week! We made a lot of progress tonight, not only getting a considerable way through the first coat of red paint, but also testing a variety of techniques for applying the retroreflective glass beads! 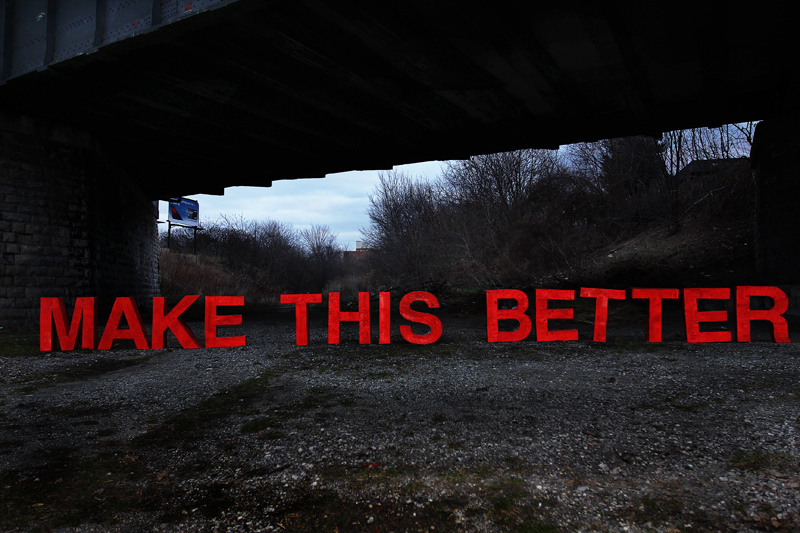 We also got to spend some time talking through how we’ll be temporarily installing the letters in a variety of spaces. We figure that there’s still at least a few more weeks of preparation and tests, but we’re really getting excited to get these out into the world. We are already nearing the end of our priming process for our letters after only beginning last week! While we got to painting the rest of the letters on Friday, I prepared a few things earlier in the week for our next step, painting the letters in a fabulous bright red. We’re on to priming the letters now, in anticipation of the bright red coat we’ll be giving them in the coming weeks. Things are moving ahead at a good pace, and hopefully will continue to, as we’d love to not be working with these finished letters in snow. While we do get together every week, it’s usually only for a couple hours. As I’ve noted before, trying to find a common time between so many schedules is hard, when what we’re doing collectively is really above and beyond the responsibilities everyone has, so we’re thrilled with the progress… but a Saturday afternoon painting party might be in order. The Letters are Done Phase 2!!! We did it. 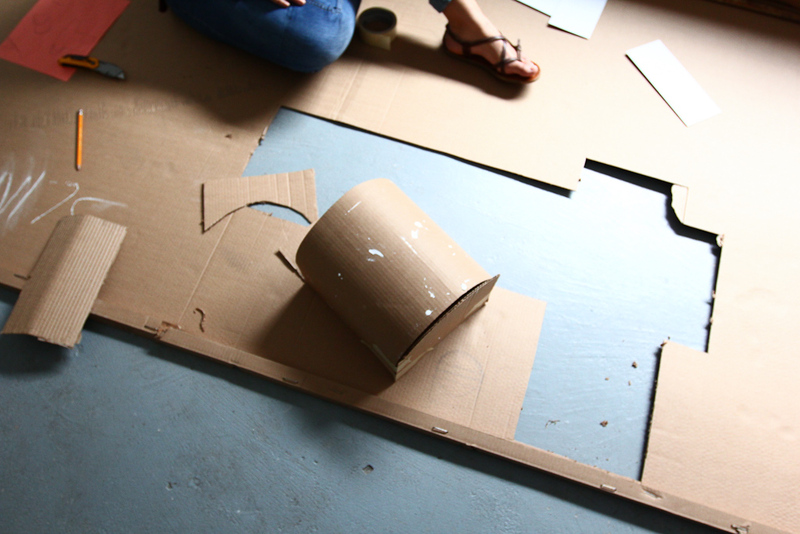 With a lot of help, we plowed through the remaining eight letters, finishing the papier maché part of the process towards completing our ongoing large-cardboard letters project. On Friday night, we had ten people around the table, including our dear Cristina for a short while, and it was great!!! 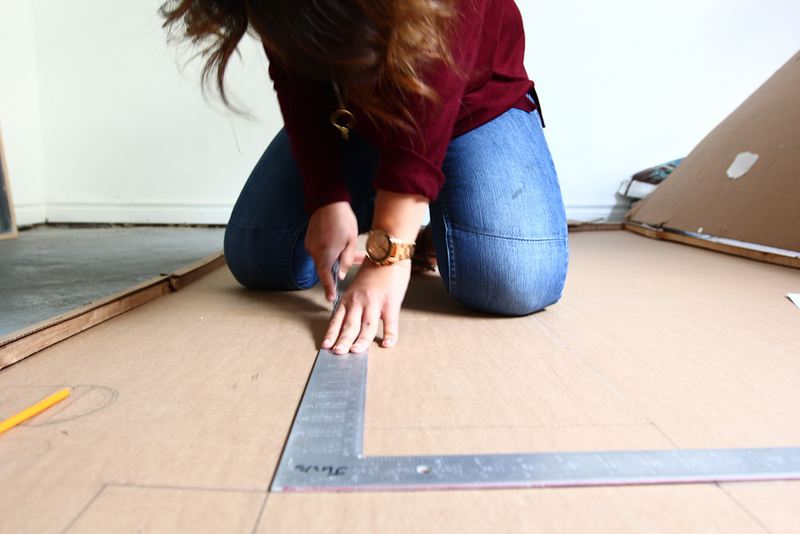 Next on the to-do list — get some test paint on some cardboard and start planning how to finish the construction phase of the project. Retroreflective Glass Beads Have Arrived, Weeks of Work Ahead! On Friday night we played with some new things that Rosina brought over — retroreflective glass beads to be exact. We also made it through another three letters doing papier maché! And, we selected a colour for the letters, again thanks to Rosina doing some recon on paint chips.